Dwyane Wade scored 11 of his 20 points in the fourth quarter, helping the Heat remain alone in eighth in the Eastern Conference with a 113-108 win over the Washington Wizards on Saturday night. 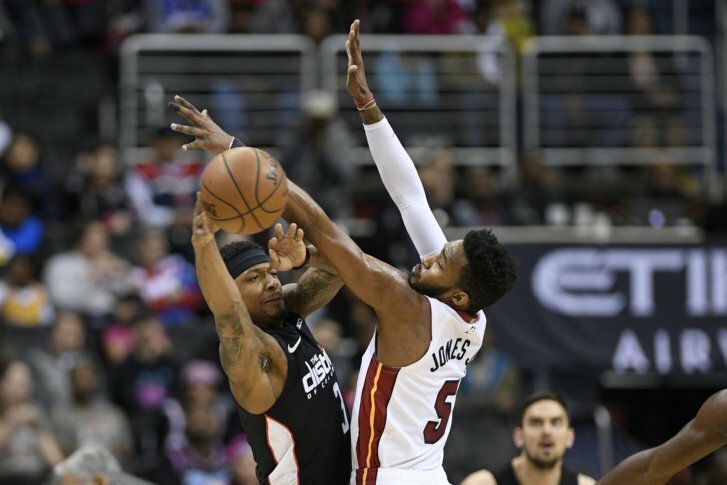 WASHINGTON (AP) — With the Miami Heat nearing the end of a grueling but successful stretch, they turned to their closer yet again. With “M-V-P!” and “Let’s go Heat!” chants echoing through the arena, Wade also had nine rebounds while scoring in double digits for a ninth consecutive game. The 13-time All-Star is retiring following the season. Dion Waiters added 19 points and Josh Richardson had 18 for Miami, which remained a game ahead of Orlando in the race for the East’s last playoff spot. Bam Adebayo had 16 points and 11 rebounds, and the Heat finished a stretch of five games in seven days with four wins, including three straight. The last four games were on the road. “They pretty much beat us in every way possible,” said Wizards All-Star Bradley Beal, who added 16 points and shot 2 for 8 from beyond the arc. The Wizards answered on their own 7-0 run, but Tomas Satoransky missed a good look at a tying 3, off Beal’s feed, with 26 seconds remaining. Wade fed Kelly Olynyk for a dunk, his last key play in 53 minutes over two nights. Heat: Including Saturday’s performance, Wade now has 1,013 career points against Washington. It’s the 10th team he’s surpassed 1,000 points against. … G/F Rodney McGruder (knee) sat out his third straight game and F Justise Winslow (thigh) missed his fourth. Wizards: Gave back a 13-point lead before halftime. … Beal picked up his second foul before the midway point of the first quarter and his third with 1:55 left in the half, but finished with four. … F Trevor Ariza (groin) missed a second straight game. Wade was the center of attention from the moment he entered the game to a standing ovation with 4:11 left in the first quarter. Many of those chanting fans lingered postgame, holding signs and jerseys as Wade exited into the team tunnel. In the late stages of his most productive NBA season, Beal credited Wade as an example to learn from in a couple areas.